Precision-engineered, quality shaving tool and accessories in an awesome set! The Cutlass is a classic metal safety razor from the iconic shaving brand The Bluebeards Revenge. Its vintage look is combined with modern precision engineering for high performance shaving. Grooves on the razor's edge lift and channel the hairs onto the blade for precise cutting and the handle features a textured grip for a secure hold when your hands are wet and covered in shaving soap. The Cutlass takes standard double-sided razor blades fitted under its blade guard that's laser-etched with The Bluebeards Revenge skull-and-crossbones logo. 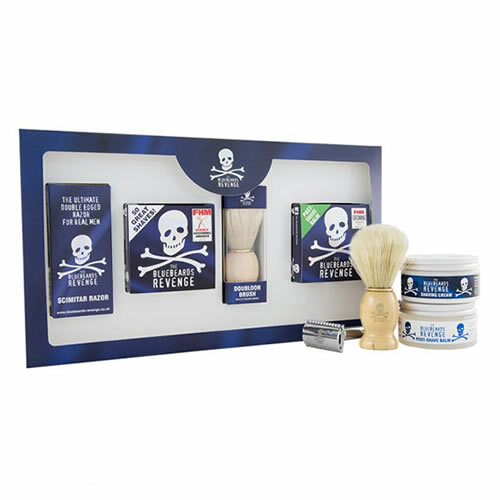 It all comes attractively packaged in a gift set, along with a 100-ml tin of The Bluebeards Revenge's own premium quality Shaving Cream to set your clients on a magnificent path to wet shave excellence! It quickly makes an impressive lather for a smoother, easier shave. The cream can be applied with the Doubloon Bristle Shaving Brush, its perfect companion. Also included in this set is some Bluebeards Revenge Post-Shave Balm and that's been specially formulated with witch hazel and aloe vera to nourish the skin after shaving. All in all, it's a terrific set that takes care of the entire wet shave experience! £41.94 (inc. VAT) Why no VAT? We're a trade wholesaler and quote our prices without VAT to help our VAT-registered customers understand the true cost of a purchase. The ultimate pre-shave lubrication for the smoothest, most glorious shave. Comes in a 125-ml bottle. Made with soothing potassium alum (which is naturally antiseptic and astringent), the Barburys Alum Block is perfect for calming the skin after shaving.